They were called “freaks” or “geeks.” But one thing is undeniable: They were remarkable. In a day and age when being different meant being unemployed, many of society’s afflicted and dispossessed turned to circus sideshows – a “Congress of Human Oddities” (ironic word choice) – to make a living. Two of those performers lived in Algonquin. Ringling Bros. and Barnum & Bailey Circus announced last month that it would be folding its tent after 146 years. 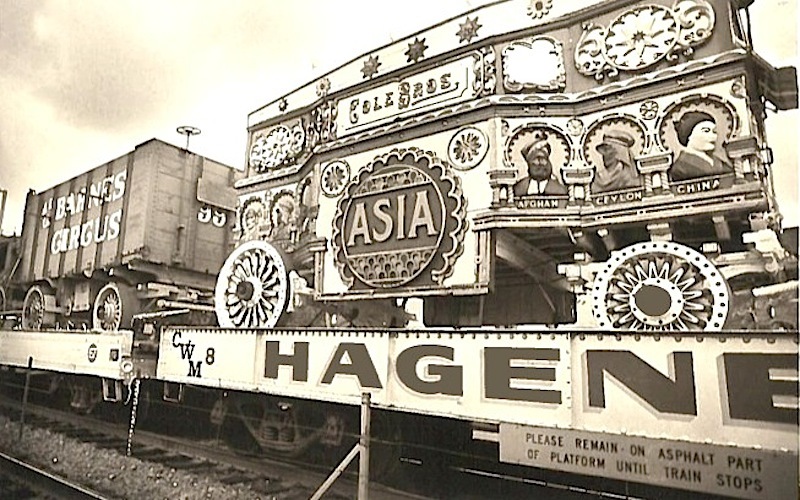 Feld Entertainment Inc., which bought the circus in 1967, announced that Ringling’s two circus units will perform their final shows May 7 in Providence, R.I. and May 22 in Uniondale, N.Y. The inspiration behind the self-proclaimed “Greatest Show on Earth” was Phineas Taylor Barnum. P.T. Barnum’s penchant for promoting paid off handsomely after a number of schemes that included public showings of a 161-year-old man, a monkey-fish hybrid and the 2-foot-5-inch General Tom Thumb. But circus sideshows had another very important function: entertaining audiences and generating cash between performances under the big top. They were divided into two types. Working acts such as sword swallowers, fire eaters, magicians and daredevil stunts that included knife throwing and being shot out of a cannon. The rest were marketed as “human oddities” and ranged from tattooed and bearded ladies, to those suffering from a physical deformity or abnormality. The spectrum included midgets and giants. Among the latter was Arthur Caley, billed as “Col. Routh Goshen,” “Col. Ruth Goshen,” “Colonel Gosham,” “The Middlebush Giant” and either the “Palestine,” “Manx” or “Arabian” giant. In fact, Goshen was born around 1820 in Sulby, on the Isle of Man. Newspaper accounts have him touring the U.S. from 1878-80. Algonquin historian Don Purn discovered that Goshen, the youngest of 12 children, paid $2,200 in 1868 for three lots along River Road and four lots along Algonquin Road. In 1871, the Weekly Wisconsin reported on the Algonquin resident’s visit to the Scientific American Magazine office where he purportedly was described as a native of Turkey, born in the hills of Palestine to a family with 14 other children and had parents who each weighed 500 pounds. As for the rank of colonel? That supposedly came courtesy of the Austrian Army … if you believe that kind of thing. Upon his death on Feb. 12, 1889, newspaper accounts listed Goshen as 7 foot, 6 inches tall and weighing 630 pounds. He left behind an estate said to be $10,000 – despite being married three times and divorced twice. 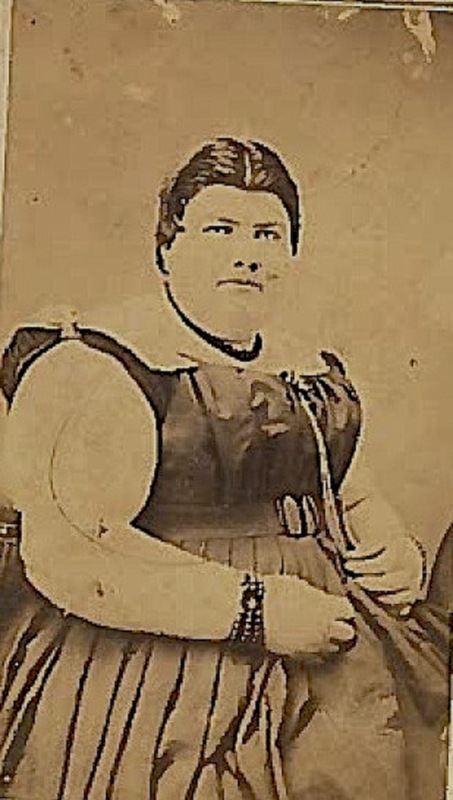 His betrothed included a German snake charmer and Mary Welch of Elgin, cousin to circus fat lady Phebe J. Dunn. As a teenager, Welch became enamored with Goshen and visited him often while he was performing across Illinois. As for Dunn, her career started off innocently enough. An 1862 edition of the Woodstock Sentinel reported that she taught at McManaman School near Three Oaks and S. Rawson Bridge roads. She also taught students at Wienke District 55, a one-room schoolhouse located at Haeger’s Bend and Chapel Hill roads. The author notes that for years after her death, Wienke students placed flowers on that bench in her memory. Dunn’s father, George, once owned 120 acres of farmland in Algonquin Township. Phebe, one of six children, later bought property at 109 S. River Road in 1860. In 1864 she toured with Goshen as part of Barnum’s Museum and Woods’ Museum. Goshen often donned a military costume with a white feather in his hat. Dunn was frequently pictured with a large snake coiled around her. Dunn reportedly tipped the scales at 437 pounds by the age of 16. She died in 1869 at age 25 in Crystal Lake and is buried in Dundee Township West Cemetery, West Dundee. You can wrangle over Ringling’s use of animal acts, if you wish. That is not my intent here. What I do know is that another culturally significant piece of our past – like transcontinental commuter rail service, the golden age of movie palaces and auto camping – has been left by the roadside. People can argue all they want over whether the world is better place for these changes, but there is one indomitable fact: We’re a different place. And that is worth at least a drum roll … a moment of wistful reflection. Join musician, author, and cultural historian Bucky Halker at 3 p.m. Monday, March 6, for “Ain’t Got a Dollar: Illinois Workers and Protest Songs, 1865-1965.” It is the first of four lectures in McHenry County Historical Society’s 31st annual Sampler Series. For more information or to buy your discounted series ticket, visit www.gothistory.org.